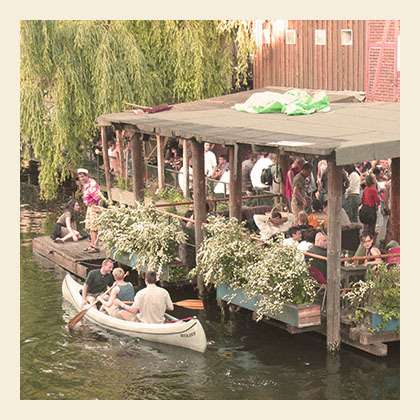 A top 10 of amazing things to do in Berlin from friday the 10th of September till sunday the 12th. Popkomm 2010 will take place in an extraordinary venue between 8th and 10 th of September – the now decommissioned airport Berlin Tempelhof. Popkomm is community oriented and opens its doors on 10th September 2010 to the general public. There will be a special program for this day. In the entrance hall of Airport Tempelhof Popkomm will also install a B2C marketplace which will be open for end consumers between 08 – 11.09.2010. Visitors of the B2C marketplace don’t have to pay admission. Companies who are music related, media partners, etc have the opportunity to present their products and services to the end consumer. B2C marketplace will present an end consumers related program including acoustic showcases and competitions, meet & greets, signature sessions, live broadcastings, music info panels, pre-listening sessions, etc. The Popkomm Showcase Festival: From 8 to 10 September 2010 there will be around 60 showcases at Airport Berlin Tempelhof at several venues. NEW: DayShowCases @ Popkomm Airport Berlin Tempelhof: exclusive showcase events taking place during the daytime. Get to know artists of 20 countries from around the world at Popkomm, participate in one of the many workshops of the all2gethernow congress or simply indulge some of the 60 concerts in this week…. It´s all about music! 44 clubs 17 bands 60 floors over 100 dj´s for only 12€!!!! there´s a bus shuttle service bringing you to all the clubs you want to visit. for more details check the website! 19 countries in an overview of contemporary dance to Berlin’s stages.